Goodman, 47, told Lilith she raised $300,000, and that her biggest supporters were fellow Yale Law School graduates and “Cabinet members”—by which she meant not a governmental panel of agency heads, but the UJA Young Leadership Cabinet, a six-year stint which grooms “young” Jews to become leaders in their Jewish communities. This support turned out to be crucial in what started out as a relatively simple two-person primary contest. Things changed when a serious rival entered the race. The contender was another woman, one who’d originally said, according to Goodman, that she was going to stay put in her state Assembly seat. Instead, she ran and won the primary. A second surprise: EMILY’s List, which endorses pro-choice Democratic office-seekers, gave significant support—and exposure—to this rival after first saying, again according to Goodman, that they planned to stay out of this race, which featured three Democrats with identical positions on reproductive rights. Goodman’s enthusiasm for running was rooted in her “outrage” at the current Administration, her frustration at its “lack of civility and corruption of democratic values.” Her work as the Executive Director of CeaseFirePA, a gun-control group, seemed to have strong support from the liberal and prosperous Jewish community in which she grew up, and attendees at the primary day luncheon of Women of Vision, the Philadelphia Jewish Women’s Foundation, applauded heartily when Goodman entered the room. Deeply embedded in her suburban Philadelphia district—her mother was the first woman to be president of their synagogue—she nonetheless faced real challenges in this race. 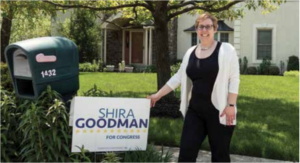 All three candidates in Goodman’s primary—her female rival and a man with name recognition as a seasoned local legislator—were pro-choice, and believed in providing universal affordable health care. But what Goodman and her campaign advisors, a husband-and-husband team from Washington, D.C., decided would help her stand out from the unexpectedly crowded field was her visibility as a longtime gun-control advocate. Her distinctive campaign slogan (“She’s the only candidate who took on the N.R.A.—and won!”) appeared on colorful mailings which gave her a clear identity for the voters. But some have asked would she have fared better as a generalist, given the fact that the northern precincts of her district are home to many gun owners?